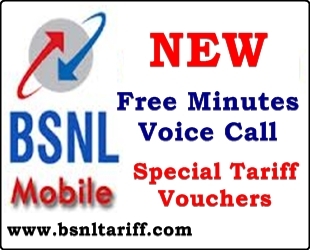 Leading Telecom Operator in India Bharat Sanchar Nigam Limited (BSNL) has launched two new Special Tariff Vouchers (STVs) as promotional basis under GSM Prepaid Mobile Services. The BSNL Competent Authority of Haryana Telecom Circle has introduced two new Prepaid Special Tariff Vouchers of Rs.150/- and Rs.310/- for limited period offer under promotional basis for Haryana BSNL Customers. Special Tariff Voucher of Rs.150/- offers, 400 minutes Free voice calls to any network with validity for 30 (1 month) days. Special Tariff Voucher of Rs.310/- offers, 900 minutes Free Voice Calls to any network with validity for 60 days (Two months). The above Special Tariff Vouchers will be implemented and with effect from 22-07-2013 to 19-10-2013.